A lumen is the SI unit of luminous flux, a measure of the total quantity of visible light emitted by a source. Luminous flux is the measure of the perceived power a light emits. This is calculated by measuring the human eye’s sensitivity over differing wavelengths of light and taking a weighted sum of all wavelengths in the visible band. A candela has the same luminous intensity as a common wax candle, multiplied by square radian (the SI unit of solid angle) to reach a lumen. Confused yet? I know, so in simpler terms a lumen is the measure of the brightness of a light. Brightness is measured on a logarithmic scale, for example a 200 lumen Portable Mini Projector is only twice as bright as a 50 lumen Pico Projector. 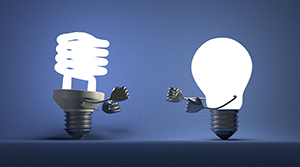 Lightbulbs with varying ranges of wattage(power) can produce the same level of lumens. For example, a 60-watt incandescent lightbulb and a 10-watt LED lightbulb both on average produce 800 lumens of light. This is due to the intensity and quality from the source of light which is being emitted. In this example, the LED lightbulb produces the same intensity light as the incandescent lightbulb but with only using a sixth of the power. Projectors rely on lumens quite a lot. The higher the lumen count normally correlates with how clear a projector can produce images. 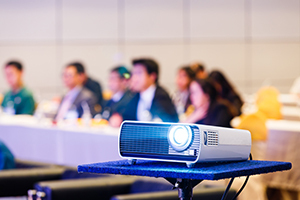 The American National Standards Institute created a testing procedure by averaging together several measurements taken at different positions to standardize a projectors lumen production. While most companies simplify the unit to say lumens, the correct term is ANSI lumens. It is important to understand the throw distance (distance between a projectors lens and its screen) for projectors. With regards to the Inverse Square Law, it states that brightness decreases as distance gets larger at a rate of 1/d2 (d = distance). This means that if the distance is doubled, than the brightness(lumens/m2) will decrease by 1/22. This essentially means that the lumens a projector produces becomes less important for the brightness of an image the further the distance becomes. Projector’s lumen count is a powerful measure to see if it will fully cover a selected projector screen. In regards to projection screens, finding a size that correlates with the projectors throw ratio and lumens count is essential. Most models of projectors will inform you on the throw ratio, or the optimal throw distance to image width. Lumen count can also be very important when thinking about the atmosphere your projector will be held in. The brighter the light (the higher the lumen count) which is emitted, the more versatile the projector is when it comes to being in rooms with other sources of light disrupting the quality of the projection. The lower lumen count projectors will most likely need to be in rooms void of light. 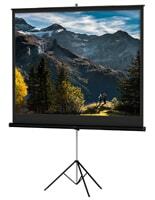 Projector Screens can be very helpful to give a uniform color and allow for a lower necessary lumen count.